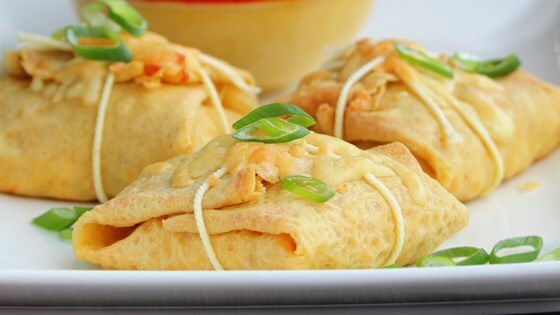 "Creamy and mildly spicy chicken filling in freshly made crepes with melted cheese on top. Yum! Serve with shredded lettuce, chopped tomatoes, and/or guacamole." Beat milk, eggs, and 1 1/2 tablespoons oil together in a bowl. Add flour and salt. Heat the remaining oil in a skillet over medium heat. Pour in about 1/4 cup batter. Cook until brown, about 3 minutes; turn and continue cooking until other side is brown, about 2 minutes more. Remove crepe and cool. Repeat with the remaining batter. Stir pepper Jack cheese, chicken, sour cream, green onions, jalapeno, garlic, chili powder, and cumin together in a bowl. Spoon 1/2 cup of the mixture onto the center of each crepe. Roll and place, seam-side down, in a single layer in a shallow 9x13-inch baking pan. Sprinkle remaining pepper Jack cheese on top. Bake in the preheated oven until bubbly and golden brown, 20 to 30 minutes. High-protein, low-calorie dish with Mexican-inspired flavors. No changes & would definitely make it again. That's how I make my oven-baked Chimichangas! The homemade tortillas are extra work, but they're worth the effort!